Well, that about sums it up, and it does so, beautifully by getting to the core energy that pulses through this film. It gets dicey and intense when these highly trained individuals are put into the most volatile of situations. It doesn’t get more volatile than bomb detail, and how they maintain composure in such circumstances is a miracle, a testament to grit and willpower. That’s not to say they don’t go through their own moments of turmoil. How could you not, at least at some juncture? It struck me that this film does not feel like a political statement, even less so than Bigelow’s other war epic Zero Dark Thirty. In a sense, that would be a major disservice to the men who fight, by taking all the attention off of them and instead placing it on agendas and politics. However, all of that is left to the politicians, and we simply are given a very small taste of what those fighting the War on Terror experience. Can we fully comprehend it? No, but at least now we have a better idea of how post-traumatic stress disorder can develop. The constant strain that these people are going through takes its toll physically and emotionally. Yet they still push through their tours in order to do the job that has been handed to them. They brave a world of suicide bombers and ambiguity that could quickly send you into the hurt locker. In that way, it reminds me of a modern take on Battle of Algiers, because not everything is as clear-cut as we would like it to be. 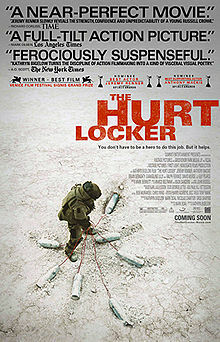 The Hurt Locker follows Bravo Company during the tour of duty. Their first disposal expert (Guy Pearce) meets with tragedy and his buddies are forced to welcome a new member to their team, Sergeant William James (Jeremy Renner). He hasn’t disarmed 873 bombs for nothing, but he maintains such a streak by being very cavalier in his conduct. He’s a maverick, a man who will unflinchingly ditch all communication in order to focus on the task at hand. He’s a bit of a loose cannon and that’s not always the best type of personality for such a tightly knit group. They have to be if they want to survive since such behavior can be the difference between life and death. There’s a camaraderie and a rapport that builds over time, but before that he causes his compatriots to squirm more than once, and when they squirm we’re positively crawling out of our skin. Shot in Jordan, quite close to the real-life locales, there is a gritty and raw quality to how Kathryn Bigelow frames the world with the help of cinematographer Barry Ackroyd. It manages to be personal and unsettling all at once. In comparison, it’s invariably striking how stagnant American life is when James returns home.That’s potentially a good thing, but does it mean that we’re taking life for granted, or living eternally thankful for each day that we still have breath in our lungs? That’s what The Hurt Locker does. It gives us a deeper respect for these men and a deeper appreciation for life. This entry was posted in 2000s, Drama, War and tagged Great Film, Guy Pearce, Jeremy Renner, Kathryn Bigelow, Review by 4StarFilmFan. Bookmark the permalink.